Jlab is renowned Ultrasonic Cleaner Manufacturer, Ultrasonic Cleaner Suppliers, Ultrasonic Cleaner Exporter, Hospital Surgical Equipments, Ultrasonic Cleaner India. 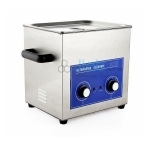 We are square measure distinguished manufacturer and supplier of splendid quality Ultrasonic Cleaner that can take away even the foremost tenacious deposits and provide excellent cleaning. Our offered cleaner is manufactured with utmost care by using the high grade quality parts and leading edge technology in compliance with international standards. After that, it is tested on many quality parameters by quality specialists.